"...and behind me is Jabba the Shed." As it started to rain, the plot thickened. "Take me to your Weeder..."
"This morning I had to sith through the soil." Eye brows have been raised by the release of the trailer for the Star Wars prequel "Darth Vader- The Early Years." Yes I know some people recommend a bug gun for green fly but I prefer a quick swipe with my light sabre. It would seem that David Prowse is no longer at the height of his fame. "Growing sprouts is harder than it looks, Amakin all over." 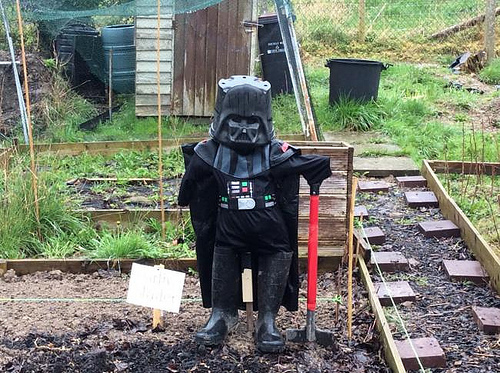 "I didn't get to where I was in the Galactic Empire by being afraid to step up and weed"
As a show of how much he loved Star Wars, there was allotment by this scarecrow.